I can't enter (being from Cdn) but I just had to comment to say Great Review. I've never heard of this series but I'll have to look for it on DVD. My daughter is fascinated with China and although she's in grade school, she would probably like the rudimentary intro to the language. I would love to enter to win this one! I have a 4yr daughter and she loves Ni Hao kai-Lan! She love Dora too and as a parent I think these two shows are great! This looks fun and educational. 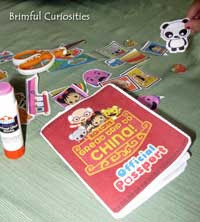 I think its so important for kids to learn about the culture of China. Please enter me! I would love for my daughter to see this! This is such a cute show with great characters kids can relate too! awesome giveaway. my daughter loves this show and actually repeats everything they tell her to say. AGH, AGH, AGH!!! Baby Liu would kill for a copy of the new Ni Hao Kai Lan DVD. Well, she's not that ferocious, but I am. I WANNA WIN. I WANNA WIN. I'm so impressed with this show. Having a rough and tumble little boy, I never thought this would catch his attention, but it did right from the beginning. And he has learned so many new things about China and even knows quite a few words. As a mother and teacher I love how educational Ni-Hao Kai-Lan is for my kids. Thanks for the opportunity. Subscribe to your RSS in Reader. As a worldwide traveler herself, I bet my daughter would love watching this! My 4 year old and 1 year old both love the show and it amazes me just how much of the language they pick up on. If I say "Ni Hao" to my one year old, he'll respond by saying "hi" back! I have never heard of this, but I think my kids would love it. Tosha loves this program. After viewing it a number of times while eating at a Chinese restaurant, she started a conversation with Ni Hao. Shocked the staff no end. my younger son ha recently started to enjoy this show. he would love this dvd! We are BIG Ni Hao fans here so my daughters would love this. I even find them speaking a few words in Chinese that they have learned from the show. MY kids enjoy watching this show and would enjoy the DVD. Thanks! My son really enjoys Ni Hao, Kai-lan. I'm sure this would be a great DVD to have in our house. Thanks. I would love to win this for my daughter. She was adopted from China at age 4.5 and is now just turned 6. She LOVES this show and asks to watch it every day. She likes learning the Chinese words because she really doesn't remember most of them. Thanks for the opportunity! My children love to watch Nihao, Kailan and are taking Mandarin in elementary school. They would love this DVD! Thanks for the chance to win! My son loves Kai-lan. He is a huge fan. I would be watching this all day. My daughter loves Kai-lan, she is 3. I'm always amazed when she counts along with Kai-lan. My daughter looks like Kai Lan and she loves her too! I would love to win this. We just went to China in October and it was the most fantastic trip ever. The DVD looks so cute! My grandchildren spent some time in Japan. I think this would be an educational DVD for them. Thanks for the wonderful giveaway. Would LOVE this for my twin girls. THey love Kai-Lan, and I love that she actually teaches them things while they are watching TV, and its not just a waste! I would love to win this for my nieces. They are Dora fans and I think they would be thrilled with this too. I love that I can find an asian role model for my 3 yr old on tv and that the program teaches her to express emotions and the importance of empathy. 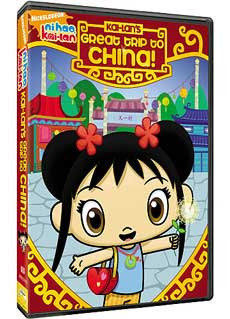 It would be great to have this dvd for her bc she likes to repeat the Chinese words and I get so excited when she does. I speak Cantonese a bit, so I also learn mandarin along with her. Having a relatively cheap Asian doll available in regular stores[just found out they're available now and more are coming out in the fall] was the highlight of my night. Searching for this doll led me to your blog. I'm so glad I did bc now I've discovered your wonderful site. Thanks! God Bless! My son likes Kai Lan. Please enter me. We have never seen this show--we don't have cable! BUt, we love to watch DVDs and hope to be able to watch this one! My daughter would so enjoy this. This is one of her favorite shows. My 4 year old is fascinated by China thanks to this show! My daughter,Maya, loves this show. I even watch myself.....not only do I like it, but I also need to know the words Maya learns. Otherwise, she'll make up words and say they're in "chinese". I really enjoy the show with my daughter - there is always some character trait that seems to be the focus of the show. I like that....along with the problem solving! Great giveaway....I'd love to win. I just followed you and tweeted about the giveaway tonight...last night of the giveaway! I just wanted to say that my dd love Kai-lan too. We watch her everyday.